The career of Jennifer Lopez is pretty amazing as she crosses the half century mark in life. Starting out as a “Fly Girl” on In Living Color and then branching out into singing and acting, Lopez has managed to still be relevant in both areas since starring as the title character in Selena. Twenty years in any creative field as a top lining anything is difficult and she’s somehow managed to juggle it in two fields. It’s her film career that’s always been the more interesting in terms of discussion. She manages to star in a lot of forgettable to bad films over the years while mixing in prime parts in genuinely interesting films and television shows every now and again. If she didn’t make bad films regularly then we wouldn’t realize she has genuine talent waiting to come out with the right project. Second Act isn’t the right project. Simple premise. Maya (Lopez) is the assistant manager at a Wal-Mart type grocery store. Turned down for the store manager position because she doesn’t quite have the right pedigree, she somehow manages to get an upper tier executive role based on a phony resume. Shenanigans ensue. We’ve seen this sort of film before and this isn’t any sort of improvement on the basic conceit of a film like Working Girl. Lopez has so much screen presence and charm that an otherwise paint by numbers film doesn’t seem as bad as it would be without someone like her in the lead. Otherwise this is a perfect dollar rental type film if you’re a fan of the genre or Lopez. You can’t ask for much with a film like this and it doesn’t deliver much, either. 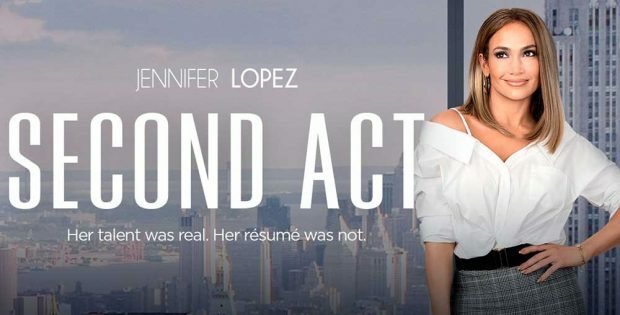 This is basically a similar film to Maid in Manhattan and the types of films that Lopez has made over the years. She could sleepwalk through it but doesn’t; while this isn’t her finest hour, far from it, she brings enough to make it worth finishing. A handful of extras are on the Blu-Ray but none are special.